So far, robot cars have been approved for testing on public roads in four US states. With the first models expected to go on sale to consumers within six years, Jenny Southan asks why learn to drive? Now in my early 30s, I admit that learning to drive is a skill I should have put my mind to mastering some time ago, but it never really seemed a priority. Living in London’s zone two, hopping on and off the Tube is far cheaper and more convenient than paying the congestion charge and navigating rush-hour traffic. However, this year, I decided to stick on my L plates in the hope that one day soon I can take the odd road trip or hire a car when overseas. Plus, I thought I’d enjoy it. Ten lessons in and, although I have been picking it up reasonably quickly, I’m realising that it is a fairly substantial investment in terms of time and money (my instructor tells me the average person needs 65 hours of practice to pass the test), not to mention nerves. The other week, a van went into the back of me after I stalled at a set of traffic lights. It was nothing serious – he had pulled up too close to me and then put his foot on the accelerator when he saw the lights go green. But, it got me thinking — if 90 per cent of road accidents, such as this one, are down to human error, surely we’d be better off in the hands of machines themselves? The experts certainly think so, predicting self-driving cars could save 21,700 lives a year in the US alone. Silicon Valley tech giant Google has been road-testing its US$150,000 self-driving Google Chauffeur cars on public roads in the US since March 2012 — Nevada became the first state to allow autonomous cars on its highways, followed by Florida, California and, most recently, Michigan in December. Texas could be next. Last year, there were rumours about Google creating a fleet of robo-taxis. Manufacturers are also getting excited. At the 2014 Consumer Electronics Show in Las Vegas, Audi demonstrated its prototype automated driving system that employs built-in satnav, lasers, cameras, ultrasonic sensors, radars to enable the vehicle to pilot itself and “communicate” with others. At the same event, BMW demoed a self-driving M235i on a racetrack, performing power slides, weaving between cones and drifting around bends (see below). Nissan is also on the case, predicting that its first self-driving cars could be on the market in 2020. According to IHS Automotive, semi-autonomous vehicles will be catching on by 2025 (about 230,000 worldwide), while full control of almost five million cars will be handed over to artificial intelligence by 2035. Nissan’s Leaf hit the road last November, in Japan’s Sagami Robot Industry Special Zone. It is equipped with “full periphery vision” so that it can detect pedestrians and other vehicles. It can also switch lanes, maintain safe distances for objects and stick to the speed limit (see below). At the end of last year, Volvo announced its “Drive Me” pilot project, which would see the introduction of 100 robot vehicles on to the streets of Gothenburg in 2017 in a bid to increase road safety. The new Volvo XC90, due to be unveiled at the end of the year, will even be able to park itself. From Ford, with its recently unleashed self-driving car that creates a “3D road map” thanks to its ability to take 2.5 million measurements every second, to Cadillac’s SRX trials of Super Cruise technology, which kicks in when you hit 50 mph, self-drive innovations are coming fast and furious. Volkswagen (AdaptIVE programme), Delphi (RACam) and Toyota (Lexus advanced active safety research vehicle) are all investing in unique features, but one of the most cutting-edge proposals comes from Rinspeed, a Swiss automotive think-tank. 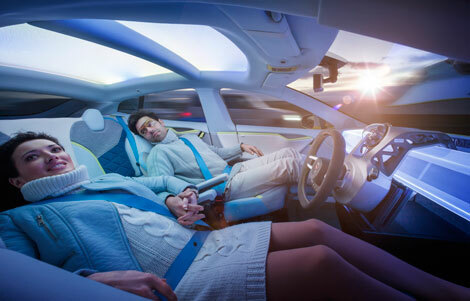 According to this BBC report, its driverless Xchange concept car, which was revealed at the Geneva Motor Show earlier this month, would take the form of a four-seater saloon fitted out to look like the interior of a private jet, creating a comfortable space for passengers to relax and work. For business travellers and commuters, this could be a truly revolutionary. Imagine how much more effectively you could use the time in your car – especially when you think that, today, it’s against the law to even make a phone call while driving. I mean, we already have satellite navigation, so it’s the next logical step. Being a technophile, I’m looking forward to the time when I can sit back and enjoy my drone vehicle whizzing me around — hopefully programmed with the voice of Samantha (if you haven’t seen Spike Jonze’s film Her, click here). And, when I want to take over, to perhaps take on the twists and turns of a beautiful mountain road, I can. Until that point, I’ll have to learn how to park.